Conservation photographer and author Dave Showalter is based in Colorado and focused on the American West. Dave has published two books - Sage Spirit, The American West at A Crossroads by Braided River (2015); and the award-winning Prairie Thunder by Skyline Press (2007). Dave's photographs and articles have appeared in numerous publications, including Audubon, Conservation Biology, Outside, Outdoor Photographer, National Parks Magazine, High Country News, Wilderness, Colorado Life and elsewhere. In partnership with Braided River, Dave's exhibit "Colorado: Sage Spirit and Roaring Rivers" is now on display at Denver International Airport, at the "Y" on Concourse A. In 2017, Dave joined the faculty of the Summit Series of Photo Workshops. 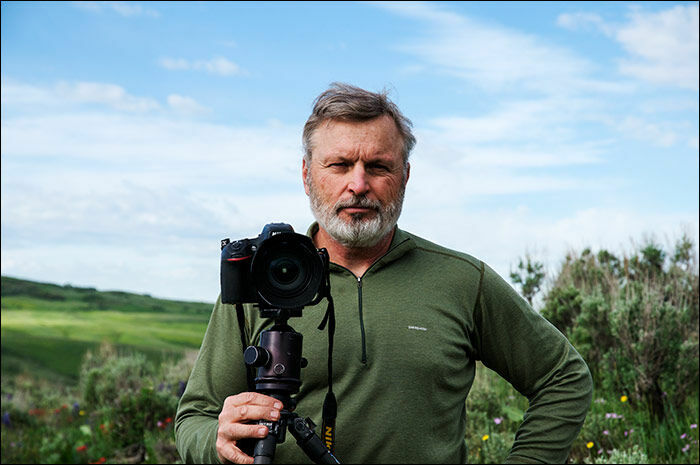 Dave is a Senior Fellow Photographer in the International League of Conservation Photographers (iLCP), and works in partnership with numerous conservation groups, including Audubon Rockies, The Wilderness Society, and Sierra Club of Wyoming. Dave has traveled extensively, presenting Sage Spirit. Please contact Dave directly through this site to plan a presentation, hire Dave for assignment, or plan a photo workshop. About wildlife shooting: I photograph wild animals in wild settings and will not photograph captive animals at game farms.